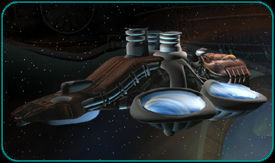 The Shee spaceship is an organic and genetically engineered starship that offers a variety of environments designed to house and provide sustenance for its occupants. The ships runs on bioenergy generated by organs which are responsible for the gaseous exchange that takes place across the surfaces of the ship and captures, filters and expels photons from both inside and outside the ship. Neural pathways lined with ashellium act as a low-energy photon trap. These photons are then transferred by a process comparable to peristalsis into the periodontal atrium whereby they are accelerated into an excited state and used as a food source for some of the crucial ship-bound components.